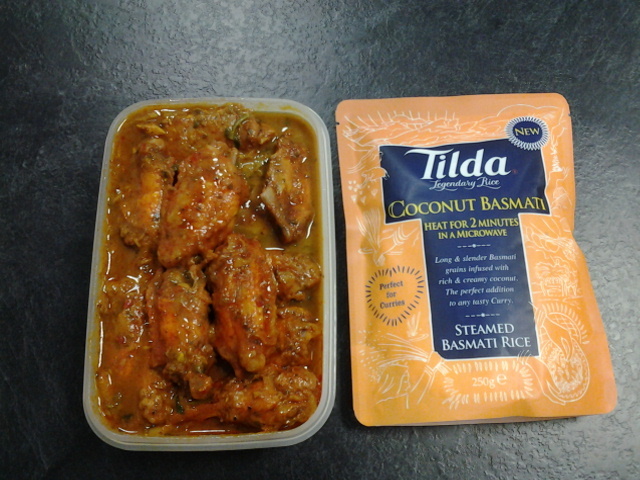 Today’s lunch is a bit of a mishmash but definitely cheaper than my normal lunches. Bought a bag of spinach on the weekend and was wondering what to do with it. I hate that spinach always come in big bags. I know they shrink when cooked but 1 bag last at least 4 meals for me. There were some lentils languishing in my pantry and thought why don’t I give Saag Daal a try? So I’m having the leftovers from dinner last night with a few added extras. Consulted a few recipes for Saag Daal online and they are variants along the same theme. Basically, you soak or boil the lentils till they are tender, fry up some onions and spices, bunk in the lentils with enough liquid and continue to boil, add the chopped up spinach and you are done! For my version, I added tomatoes, ginger and garlic and for the spices, I went with tumeric, coriander, cumin, fennel seeds, chilli powder and a bit of all spice. Turned out pretty good I think! 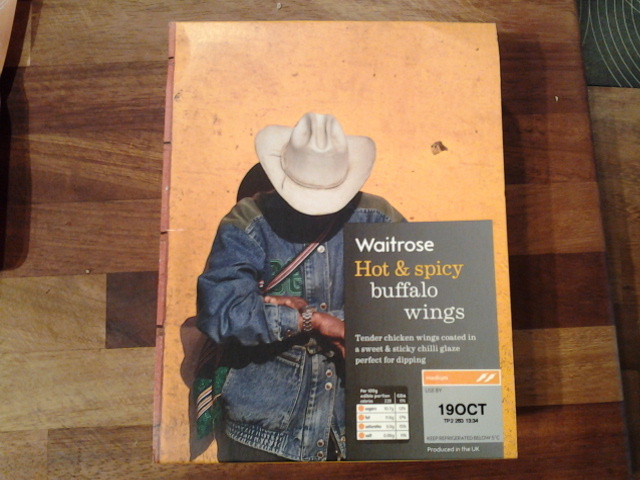 Waitrose currently have a 1/3 off all chilled ready meals and I was tempted by the Hot and Spicy Buffalo Wings. I believe after discount, it was £1.99 for 12 wings which I thought was a good deal. Since it’s from Waitrose and need to cater for the mass market, I knew it will never be that spicy but was quietly hopeful. Alas, my instinct was right, it’s not spicy at all and to add insult to injury, it’s sweet. Decided to use it to bulk up my lunch as the wings are too depressing to eat on it’s own. Will need to go back to the Orange Buffalo for my wing kicks soon. For the carb portion of my lunch, I went digging into my trusty pantry and found the last bag of Tilda’s microwave basmati rice. This time, it’s Coconut Basmati and I knew it will match my Saag Daal well as it says on the package “Perfect for curries”! In all, a very satisfying lunch. The Saag Daal brewed up overnight and I can taste the fennel and all spice coming thru the sweetness of the tomatoes and onions. The buffalo wings were ok after generous lashings of Tabasco sauce. 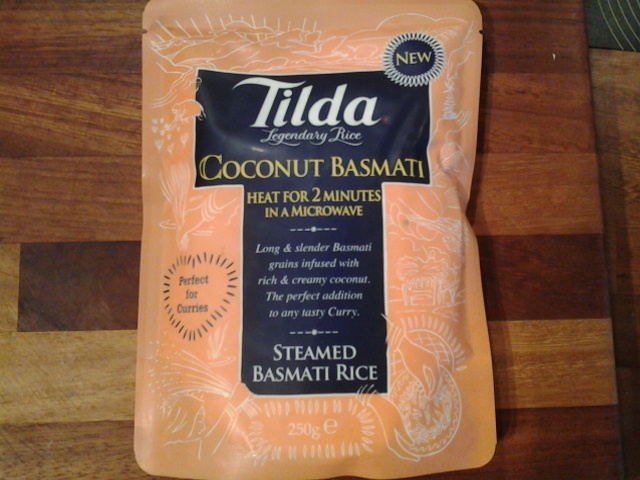 As for the rice, not the best in the Tilda’s range but pleasant enough with quite a bit of shredded coconut scattered amongst the rice grains. 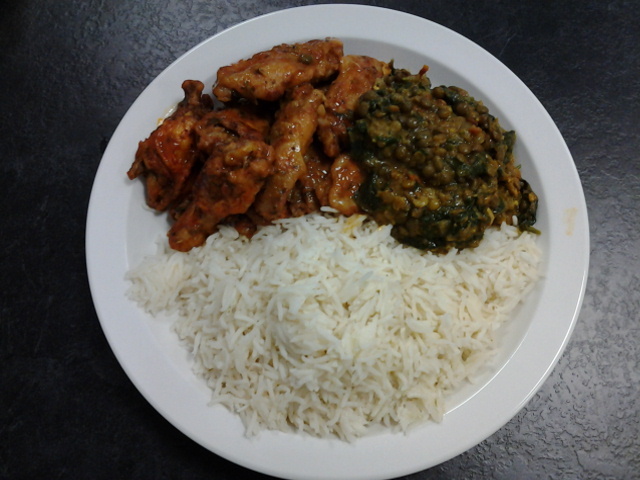 I will definitely cook Saag Daal again in the near future.